Monday 24th May was a bank holiday in large parts of Belgium, the Netherlands and Germany, and I could have continued my Benelux weekend with another play off for the Belgium League. However, instead I turned further east and decided instead to go into Germany. When the Third division was created in Germany; the number of Regional leagues was increased from two to three while dropping to be the fourth level of German football. 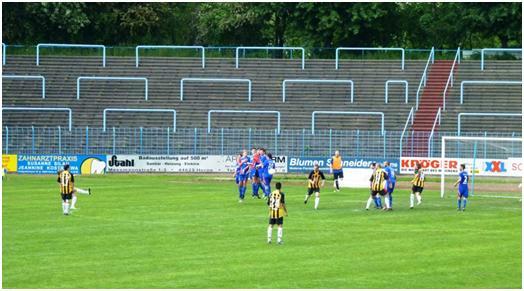 This meant that the Oberliga would be the fifth level, and would lose all lose teams to the new structure. If nothing had changed, then the existing nine Oberliga before the changes would have become the feeders to the new Regionalliga with the nine champions promoted, and three teams relegated from each. But this not fit in with the wishes of all the clubs. Six of the Oberliga remain unchanged in area, and each have one promotion slot. In the North region, the clubs protested at the amount of travelling for a reduced standard of football, and decided to break up the area into five area, Niedersachsen had both an East and West league, Schleswig-Holstein has its own league and the two Hanseatic city states, Hamburg and Bremen have one each. These was the same as the organisation at the next level down. Even with five leagues, there is only one promotion to be had. In the most populous areas of Westfalia and Nordrhein, the distances are not so large, and there are a number of big clubs. These decided not to make the leagues smaller, but to go the other way, and the two Oberliga merged to form the NRW-Liga. This league keeps both its promotion places. Typically the leagues in Germany continue until the end of May, and some in the East may go on into June. So this holiday Monday is the penultimate round of fixtures in NRW-Liga. SC Wiedenbruck 2000 have already won promotion and the title, while Arminia Bielfeld’s second team lead Germania Windeck by one point for the second place, (there are no limitations on reserve teams getting promoted here). 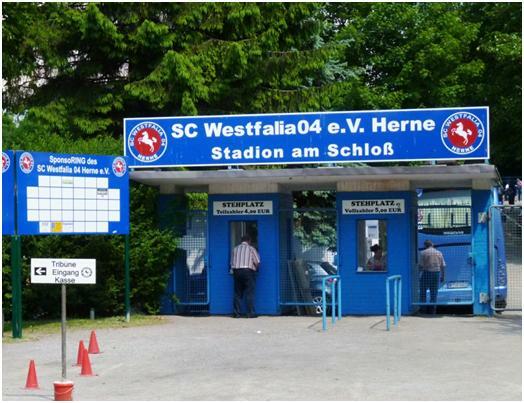 So my destination for the day is the Stadion am Schloss Strünkede, listed as the largest in the division, to see SC Westfalia 04 Herne at home to Windeck. Only 5 to stand here  the programme was A4 size and quite thin and cost an extra 50 cents. I did not check how much extra it was to sit  the seating area had a separate entrance to the main terracing, and there was no movement between the sections. 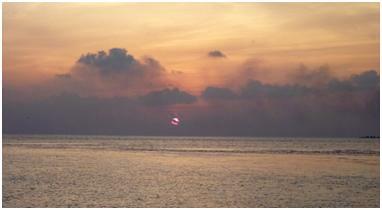 The stand provides the only covered accommodation available. The rest of the ground has been built up, with around 30 steps of concrete to provide a large bowl. When you enter the ground, you climb a slope that leads you to the top, behind one goal. From here, there is a path at the top of the terracing that would once have led all the way around the ground (with entrances to the top of the stand at each end). The only exception to the ability to make a complete circuit is a gap near where one starts, where there is a cutting to allow the players access to the field. 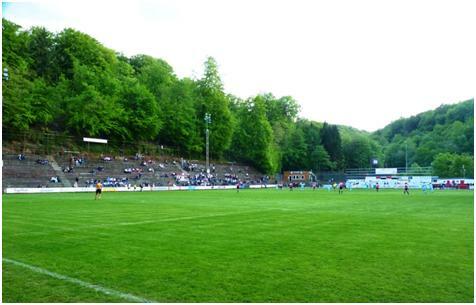 This ground has been built up from scratch  the pitch is at the same level as both the road one side, and the stream that runs behind the far terracing. You can no longer walk all the way along, as various pens have been fenced off. The few away fans appeared to be in the section between the entrance and the stand, (I saw no one wearing their colours, despite the importance of the game), and the end furthest from the entrance was completely closed and empty. Still, in such a big stadium, the 500 or so spectators rattle around  either sitting or standing in small groups towards the top of the terrace. There are two reasons for keeping to the high ground. One is that the path is at the top, and you have to step down to you position, while the other one if that a nice 10 foot fence which means that the few is restricted for anyone standing in the front ten rows. Not that anyone was doing so. Behind the goal, there are a few stalls selling beer and bratwurst, etc., and a souvenir stall where I bought a pen and a postcard. Most of the stalls appeared like hastily erected shacks, while the “VIP zone”, (the blue building overhanging the terrace behind the goal) has the appearance of a portacabin  as far as I could see, it was not in use. The white building you can just see behind the terrace if the dressing room and office block, where they happily handed me a copy of the team sheet on request. Herne, playing in blue, lose sight of the ball as another attack is easily cleared. As for the match, it will soon be forgotten. Herne kicked off, held the ball for best part of a minute  Windeck moved it upfield, crossed from the inside left position to Hayer who was left completely unmarked. He headed the ball into the net, and that was it  game over. 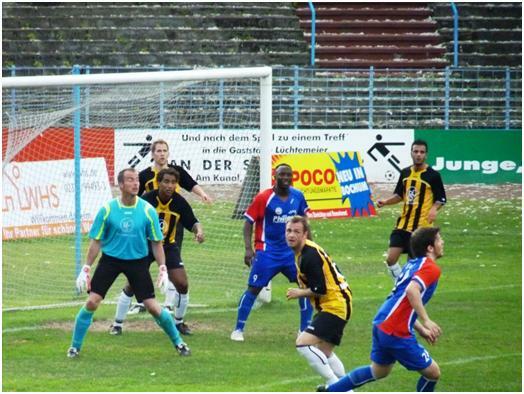 Despite needing to win the game to have a chance at promotion, Windeck never committed players in an attacking position. They played in a 4-4-1-1 formation, and never allowed both wingers to move forward together. This meant they had limited options, and the defence had an easy day. Herne committed five players to defence  a flat back four with a midfielder playing just in front. If they were to make an excuse for not scoring, then I guess it would be “we are incompetent”. It was soon clear that the 1-0 away win was suitable to both teams, as the game slowed down and both employed time wasting tactics. The referee went along with this  no injury time in the first half, two minutes only in the second  despite several stoppages, and six substitutions. The biggest cheer of the day game twelve minutes from time, when Herne substituted their goalkeeper, Oliver Bautz. This action itself took longer than the total injury time allowed for the half. Bautz left the field to what can only be described as a sitting ovation, (no one got up to cheer him). I assume he is moving on next season, and this was his last home game for Westfalia. A late free kick threatens the empty terrace more than the goal. A Benelux Weekend, Part 2. Benelux means, Belgium, Luxembourg and the Netherlands  so having done games in the first two on Thursday and Friday, it had to be the Netherlands on Saturday. The three hours of driving from south of Liege to Rijssen passed without incident. 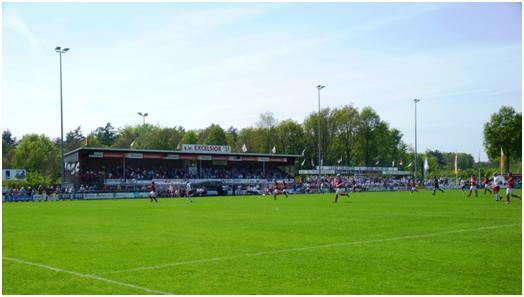 Hidden in the woods on the Southern side of the town is the Sportpark de Koerbelt, home of Excelsior ’31. I paid my 8 to enter (an “Amateur” game in the Netherlands costs more than a “Professional” one in Luxembourg), and picked up the small A5 programme (free). I then went in search of the team sheets. I found an office where several people were writing official team sheets. They were happy to talk to me, and offered me a coffee when they found I had come over from England  but then when I asked which sheet was for the first team, I discovered that this office was only for the other teams. Looking at the tables, I discovered that Excelsior put out 15 full men’s teams on any given Saturday, plus no less than 43 youth teams. According to those in the office, this makes them the biggest club in the Eastern Netherlands. A signpost outside the clubhouse points you towards the six pitches on site  but this cannot be enough, even with staggered kick off times through the day, they must use other fields as well. 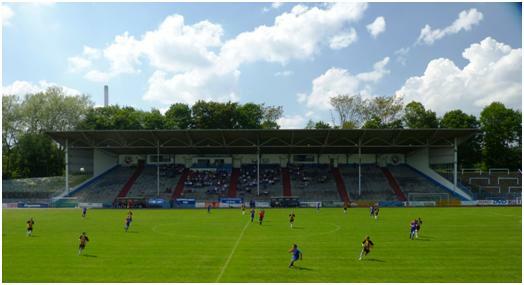 The main pitch has a stand for around 400 people, taking up about half the length of the side, and a few steps of terracing to one side of this. The rest of the playing area has a flat pathway all around. The ground raises behind the goal and in front of the club house. The slope is grassed, except for a steps down the centre, with a few benches placed at the top of the slope, (of course, somewhere down one side there is a ramp for disabled supporters  I saw an electric wheelchair pass by at the lower level, and then pass me again at the top of the stairs). There were spectators sitting on the benches and on the grass. 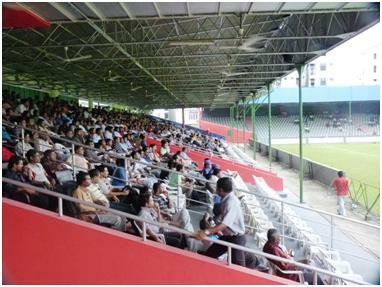 Despite a restricted view, around a hundred people appeared to watch the game without leaving the terrace in front of the club house. It seems to be the rule that you cannot take your beer with you down the steps. Well, it was a warm afternoon, so who is to blame those who stay close to their beer? As teams entered the pitch, not only did we have the banner wavers above, but also smoke flares and firecrackers. I noticed that all of these were set off from outside the playing area  everything is stage managed in the Netherlands, and the health and safety rules here make the UK seem dangerously lax. With the players not entering the pitch until the official kick off time, the match was five minutes late in starting. 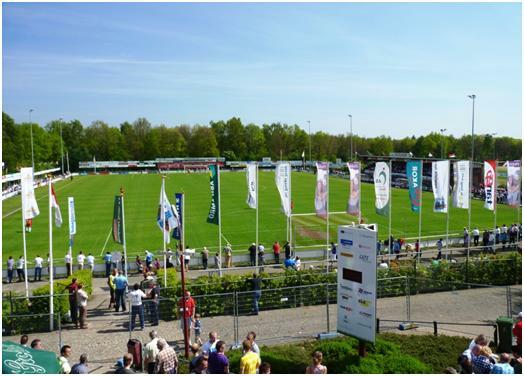 The match is part of the Zaterdag Landskampioenschap, (aka the Saturday Amateur Championships), and this is the last season it will be played. Currently the Hoofdklasse, the top level below the Netherlands League consists of three Saturday divisions (and three more on Sunday) with the champions playing off in a round robin, (two home games each) before the Amateur championship final, when the Saturday and Sunday champions finally meet to decide the overall champions. From next season, there will be Topklasse above the Hoofdklasse  providing a national championship for each day, and meaning only one tie is required to decide the overall champions. Barendrecht won group A, Excelsior won group C  but going into this game, the group B champions, IJsselmeervogels held the advantage with a win over Excelsior, and a draw at Barendrecht. The first half was generally even, with both sides creating chances, but only one being taken  this was by the home forward, Niki Leferink after only 70 seconds of play. Excelsior 31 are in the Red. At half time, I managed to get back to the invites only area where I had picked up the teams (after being re-directed from downstairs). More free coffee, and cream cakes as well. The view from the top floor balcony was great, and I might have been tempted to stay if not for the flags. The second half changed complexion with 20 minutes to go, when Niki Leferenk was spotted diving in the penalty area. It was so blatant that there was no massive shout for a penalty, even from the crowd  and the referee agreed. But for Niki, the bad news was that he already had picked up a yellow card, so this was his second, and off he went. Still, it was his early goal that separated the teams, and continued to do so. The game moved slowly, as the home side were trying to waste time, and the referee never failed to accept an excuse to allow the trainers onto the pitch, not even demanding that the ‘injured’ players leave the pitch for a minute. With the advantage of a man more, Barendrecht were camped in the opposition territory, but everything they tried was blocked. It appeared to me that their game was too predictable, and that Excelsior were successfully predicting where the ball was going to go. To score a goal, a little pace and some randomness can help, and for all Barendrecht’s fine passing moves, they did not have this. The only way that Barendrecht were going to score was with a move that was so perfect that Excelsior could not stop it, even knowing where the ball should go. It took until five minutes of injury time had passed to produce this. A free kick about 25 yards out, with the Excelsior wall surprisingly close to the ball, but a rocket of a shot from Alex van Dommelen, straight into the top corner of the net. The 1-1 draw was not really wanted by either side, as IJsselmeervogels remain in the group’s driving seat with a home game against Barendrecht on Tuesday. The slow match  late start, nine minutes of injury time (over two halves) and an 18 minute half time period was not to my liking either. It was already gone 4.30 when the game finished; not bad for a 2.30 start. I needed at least ten minutes more if I was to try and get to Gemert, where their Sunday Landskampioenschap game was taking place on the Saturday, at 6 O’clock. I gave it a good try, but it was more than ten minutes after kick off time when I finally reached Gemert. I did not stop, but went straight on in search of a hotel. For Sunday, it was back to Belgium, and the play offs for a place in the League. 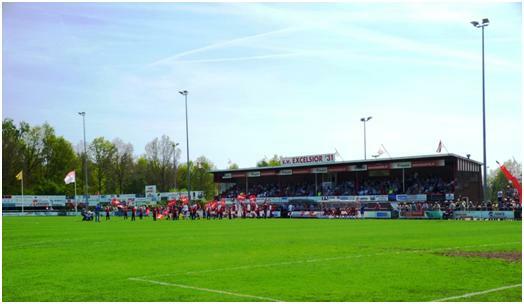 I had considered returning to the Antwerp play offs, and seeing the second leg at Houtvenne  but instead chose Herk-de-Stad in Limburg. The simple reasoning was that of the teams at home on the day, this was the one furthest from Calais, and therefore the least likely for me to pick up on a day trip. Most likely, I shall drive a party over and drop everyone else in Herk, and then go off to one of the other grounds I need nearby!! Anyway, I reached Herk easily enough  it is a small town not far from Hasselt. I arrived about an hour before kick-off, and nothing was open in the town, but the clubhouse was already buzzing. Often the clubs are quiet with business picking up only in the last 15 minutes or so before the start, but with a coach load of visiting supporters, this one was busier. It was 7 to enter. No programme and the team sheet was a photo copy of the official handwritten list that has to be given to the referee. The clubhouse takes up more than half of one side, and with windows pitch side, it provides a good viewing area in itself. There is a little shelter erected in front of the clubhouse, but this is mainly to protect the steps up from the dressing room, while a few seats are for officials only. There are two areas of covered standing, a smallish one near the entrance, and a much longer structure diagonally opposite. Both of these have a step or two to increase capacity, whereas the rest of the pitch surround is a typical flat standing. I estimated the crowd around 400. The fans were in good form, and none of the ‘organisation’ found in the Netherlands. The visitors had brought some smoke flares and firecrackers into the ground, while green and red hats worn by the home supporters (and one or two visitors) gave them the look that they had escaped from some St Patrick’s day parade. Visiting fans, one wearing home colours on his hat. Despite the preponderance of black and white shown by their fans, Bievre actually played in a light blue which I wondered how to describe  was it tending to turquoise, or was that an illusion caused by the lime green trims and numbers? 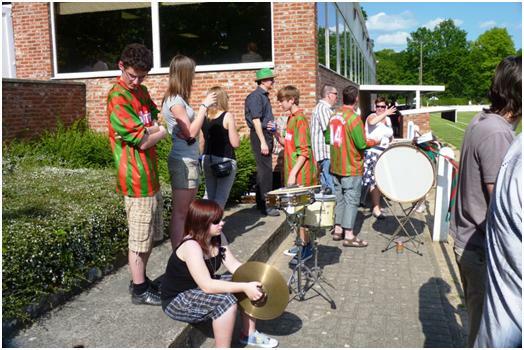 Meanwhile a small number of home fans set up a band. 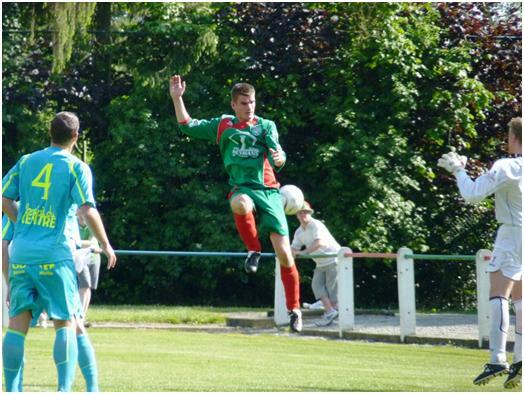 Royal Standard FC Bievre came into the match having finished fourth in the Namur province. They then beat Spy (away) and Yvoir to reach the interprovincial stage  Namur play offs are single games. 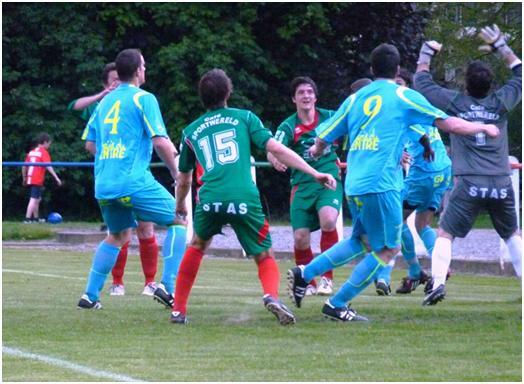 Herk-de-Stad were second in the Limburg league, and followed this with wins over Koersel and RC Hades  in this case the matches were over two legs. The Interprovincial matches are all to be settled in a day. Bievre made the brighter start, and seemed well in control for half and hour, although they were finding it difficult to find clear cut chances to force the home keeper to do any work. Herk-de-Stad had lined up a fairly flat five man defensive line, which meant they were outnumbered in midfield, even though one of other of the two forwards kept dropping back to help. Bievre were more standard as a 4-4-2. It was therefore against the run of play when Herk forward Bob Putzeys took a shot from the edge of the area and through the crowd on 31 minutes. The ball stayed low, and the keeper dived too late. Herk had the better of the play, and looked to be on top early in the second half. I noted that they had pushed a player forward into the more standard 4-4-2 formation and this seemed to suit them better. Just after the hour mark, they had a ‘set back’. Kim Claes, the left back brought down an opponent with a violent challenge that earned him a straight red card. Two minutes later, they withdrew one of the forwards in order to bring on a substitute and play on in 4-4-1. David Beckers misdirects a header, shortly before being substituted. To be honest, you would not have realised that Herk were a man down  for the next 15 minutes they continued to dominate the game, and were causing considerable problems to the Bievre defence. Putzeys and attacking midfielder Michiel Derwael causing the problems. With 15 minutes to play, it was clear that Bievre needed to change something to get back into the game  so they withdrew a defender and brought on the improbably tall Francois Toussant to create a three man attack. This caused instant confusion, and within two minutes the defence had messed up on marking duties leaving the earlier sub, Tanguy Daouet to level the scores. Extra time beckoned. I noticed that despite taking a mid half drinks break in both halves, this game reached 90 minutes at least 7 minutes quicker than the previous day’s effort. I also noticed that while the previous day’s match had consisted of only precise passing, that may have delighted the perfectionist, but led to few chances  this match was a mixture of long and short balls  which meant the defenders had to be on their toes, and there was plenty of goal mouth incident. Naturally, once expected the side with a man advantage to be in command as player’s legs tired in extra time, and this appeared true for a while. When Toussant scored a minute before the extra time break, surely the writing was on the wall. Panic in the Herk defence. Toussant (9) ends up pulling away to the post, where he scores what is almost a tap in to put Bievre 2-1 up after 104 minutes. If the writing was on the wall, then I guess it was in French (the language spoken in Bievre) and was ignored by the Flemish speakers from Herk. The half time whistle of extra time came immediately after the restart  for the home teams equalising goal. It was the substitute left back, Jelle Verheyen who had pushed up the field for a corner that scored the goal. This rejuvenated the home team, but with only ten men they were never going to regain dominance. Half way through the second period they were awarded a free kick 25 yards out, but it bounced back off the wall, (perhaps the one with the French writing on it?). The loose ball fell the Kristof Pirlet  the player who had started in defence but moved to midfield when Herk went to 4-4-2/4-4-1. Still from around 25 yards he hit a thunderous shot into the roof of the goal. Bievre never gave up, and came close to levelling the scores again. Remembering that three substitutes had scored in Luxembourg, (and two had already scored for Bievre), I got hopeful when the visitors’ third sub was given the final three minutes, but in fact he hardly saw the ball. The home celebrations at the end of the game were as if they had won promotion. Technically, they have to win another game, (away to Opwijk, the team attempting to avoid the drop) to do so, or win the play-off losers final, as I have heard of one merger that will cause a vacancy in next season’s league. Perhaps there is more I have not yet heard of, and this match gives Herk a place in the higher league? 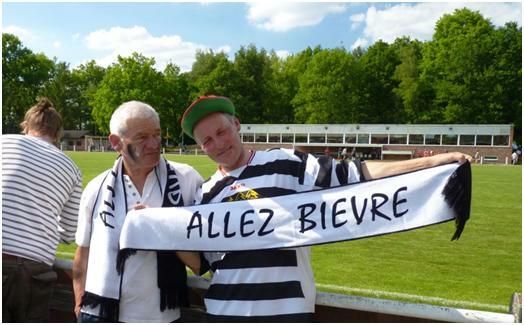 Meanwhile, I note from the Kaelijne web site that they went on from the home win I reported earlier, to win 3-0 in Houtvenne and hence they are in the League next season. A Benelux Weekend, Part 1. I like to tour Europe after most of the English season has completed. You get a couple of weeks in mid and late May when it is possible to see a match practically every day. This season, though, my work schedule has been uncertain and I have found myself unable to book leave well in advance. I will make up for it by trying to find trips in June and July and adding to my countries total. An uncertain work schedule is not the same as a full one. We are in the commissioning phase of a project, and I often have to wait while mechanical issues are sorted. The result was that on Tuesday, I was cleared for a full week off. Immediately, I am on the internet, looking at fixtures, flights and other schedules. In the end, I select a Eurostar trip to Belgium. This is not the cheapest option at short notice, but Eurostar is a quick and comfortable way of getting into the nearer parts of Europe. I also book a car for all but my first day, meaning this is not going to be a cheap weekend. I am not travelling in France, and barely touching Germany, so rail, where available would surely be cheaper. My first question is where to leave the car for the trip. My first thoughts were to use Eurostar’s intermediate stations, either Ebbsfleet or Ashford  but when I look them up, I find they charge £8 to charge at one and £11.50 at the other  per day!! What is the point in putting stations in that are conveniently close to motorways, and then charging extortionate fees to park the car? Anyway, as I also discover, the services to these stations are poor. I want to have the chance to get to a game in England on the day I return, so I decide to look for a place to park to the North of London, settling for a residential road neat Oakleigh Park station near Barnet. A 20 minute ride takes me from here to Kings Cross, meaning I only have to cross the road to pick up Eurostar. Then it is onwards to Brussels and Antwerp  I have pre-booked a hotel by Antwerp station. I have a while to wait at St Pancras before the train, but I am pleased to discover that not only do they provide a row of sockets to plug in lap tops, but that the Wi-Fi service there is free. 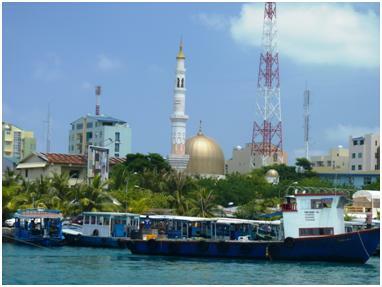 Wi-Fi services when travelling are odd, insofar as they are either free, or expensive. I have never come across a service where you have to pay, but the charges are reasonable. The good news is that free services are becoming more common. Wetherspoon’s pub chain is a well known place for free connections, and half the motorway services have added themselves to the list. The Belgium and Netherlands Leagues have completed their fixtures, but this is still my destination. Both countries go in for numerous play offs to decide promotion and relegation issues. Both also have the curious concept of the period championship  dividing the season into three, four or even six segments and giving the winner of each part season the title of period champions. Then when it comes to the end of the season, any period champion that has not won promotion automatically will have the chance to try via the play-offs, no matter where they finish in the league. Although it must be possible, I cannot find a case of a period champion finishing in the relegation zone to see what happens then. I know of one Belgium team that had been in financial troubles, but still made the play-offs. They were told they would be automatically relegated one division, but by winning “promotion” by the play-offs, they eventually stayed at their starting point! The number of teams in the play offs is fixed, so the highest placed teams that have not won promotion are used to fill the spaces. Vossevelden, Katelijne, showing the seating stand. The Belgium League is organised with a national league of four levels, with progressive regionalisation as you go down. The top two divisions are national, with two sections at Division 3, and four at division four, (which for some reason is called ‘Promotion’). Below this, there are nine provinces, each with their own regionalisation as your drop down. The rule in the National leagues, which I think applies down the levels as well is that only champions get promoted, and everyone else takes their chances in the play-offs  although the number of teams competing in any set of play offs differs. In many cases, one team in a play-off series is bidding to hold its place in the higher division. At the bottom of the fourth division, the last three in each group gets relegated, meaning 12 promotion places on offer. All nine provincial champions go up, along with a play off winner from three  Antwerp, Brabant and Oost Vlaanderen. I assume these are the most populous regions. The other six provinces also have their own play off, with the winners going in with those teams finishing fourth from bottom in Division Four, in the Interprovincial play offs. My first match of the trip was to be in the Antwerp provincial play offs. These are two legged knock out games, and despite lower league positions Katelijne and Houtvenne reached the finals with some ease. From Antwerp, I made a 30 minute train ride to Katelijne for the first leg match, followed by a 30 minute walk from the station. It was 7 to get into a fairly typical Belgium ground. 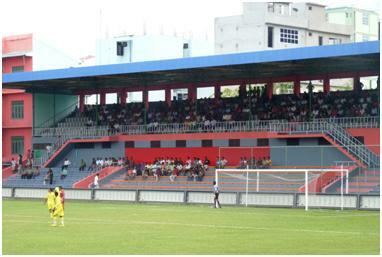 Most of the pitch surrounds being a flat path, with about 100 seats in a small stand, and more covered accommodation provided in front of the club house. There is a also a small stand near the entrance, offset from centre behind the goal line. This is one where the roof extends both sides of a central wall, providing cover for both the main pitch, and a second pitch in a single structure. The importance of the match  a place in the league for the winners brought out a good crowd, around 500 compared to the average of under 100 you might expect in the provincial leagues, or two to three hundred in the lower divisions of the national league. No programme was issued, but a printed team sheet was freely available. Katelijne in White, Showing the cover behind the goal. We were treated to an entertaining game  the home side made a break through after 12 minutes, but conceded an equaliser just minutes before the break. It was at this point that the Katelijne full back Jon van Dessel became the hero of the hour  moving up field to head in a corner as the first half went into injury time, and then repeating the feat 17 minutes into the second period. Houtvenne applied pressure throughout the final half hour, and it is difficult to say how they managed not to pull one goal back, but 3-1 remained the final score. I suspect this match is far from over, and will be looking for the second leg result with interest. Jon van Dessel leaps to put Katelijne 2-1 ahead. On Friday morning, I got a rare lie in, leaving my hotel at 11.00 to pick up my hire car and head for Luxembourg. I decided not to take the shortest route (round Brussels), but to go via Liege, and try and find a stopover just south of the city, placing me well for the Saturday, while still being able to return to the hotel before midnight. This was easier said than done  even though I was reaching the Ardennes, the bit of Belgium that is not flat and is attractive to the outdoor loving locals, it is not easy to find a hotel, while signs that appear to point to tourist information actually point to town halls. 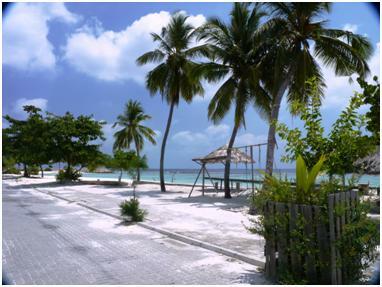 The first hotel I checked appeared open, but deserted. Still it was a three star and looked likely to charge more than I liked. The next was full, citing that this was a holiday weekend and special. Belgium has to bank holiday weekends in a row at this time of the year, so how special? Certainly not for the next one I tried, which was closed completely. I did find a place, slightly further south than I had planned. Considering that 10 km away, all the hotels were full, it appears I may be the only guest at this one. Once I left my hotel, it was a straight forward drive for about an hour to reach the Luxembourg border  but once one crosses the border, confusion reigns. I entered near the town of Rodange, which m map showed as being on the way to Differdange. However, there were no signs pointing the direction to go forward. One street was lined both sides with about 20 petrol stations, and I thought I would be able to glance at a map in one of the attached shops. No one had a map though, and all I could get were unclear directions. One thing was certain  once past all the petrol stations I entered France, and I knew I had no intention to be in France, so I turned back before I had gone more than a few hundred meters. 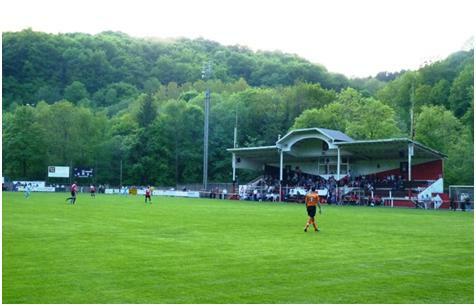 There is a football ground with a stand right on the border, probably belonging to Rodange, although the signs were not clear enough to show which side of the border it was on, or if it even straddled the line. Eventually, I found my way, passing my second choice ground of the day, Progres Niedercorn en route. Unfortunately, with two teams fighting out for the title on the final day of the season, I had already been to both. Jeunesse Esch starting with a single point lead over F91 Dudelange. Progres were in 11th place in a 14 team league, which meant they needed to maintain their position to avoid a relegation play off. UN Kaerjeng are otherwise in the play-off spot, while US Rumelange (at Jeunesse Esch) and Mondercange (at Progres) were relegated. That left the question of the other European slots. Obviously whichever team won the league go into the Champions League, and the runners-up into the Europa League, but third place also gets a try at the Europa League (and of course the cup winners, but that is still to come, as both the semi-finals and final are in the next week). Racing FC Union Luxembourg are in third place, but FC 03 Differdenge are only two points behind, and these two teams were to meet on the final day. The catch for Differdenge is that they do not start the day in fourth, but sixth place. Both Fola Esch and Grevenmacher are a point ahead. 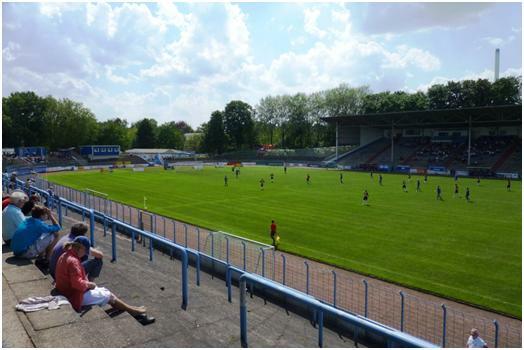 Now, quite a few Luxembourg grounds have been modernised in recent years  fortunately, the Stade de Thillenberg is not one of them. This is a gem, one of the most interesting grounds I have visited in years. One approaches the ground up a steep hill, and under a bridge, gaining a glimpse above of a brick wall, (looking as if it may fall down the hill at any moment), and the back of the stand. A corner of the ground is up on concrete pillars, with a ten foot drop below, and then you round the corner to see the entrance gate. 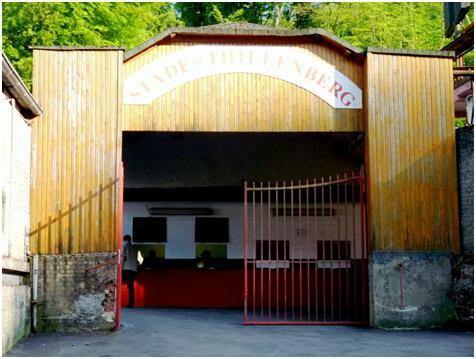 Stade de Thillenberg  the gate. I do not think I have ever seen anything quite like this. What you can see behind the gates are the pay booths, were for 7, you are given a piece of coloured paper with a pattern on it, but no discernable information. A part if this ticket is perforated and torn off seconds later as you enter the stadium. Also on offer is what appears to be an A4 programme, but on closer inspection is actually a season brochure, with all the details for the season. Pre-printed at the start of the season, it does not include a late change with this set of fixtures being set for 8 days later. Most of the magazine is in French, as are most of the posters and adverts around the ground, and also the language spoken by the locals in this area. The fixture list is given in French (copied straight from an official document, I guess). However, everywhere else, the name of the home club is not in French, nor German, (the other widely spoken language of the country). Instead it is in Luxembourgish, and so FC 03 Differdange becomes FC 03 Deifferdeng. The same goes for the visitors, whose club badge describes them as Racing Football Club Union Lëtzebuerg. 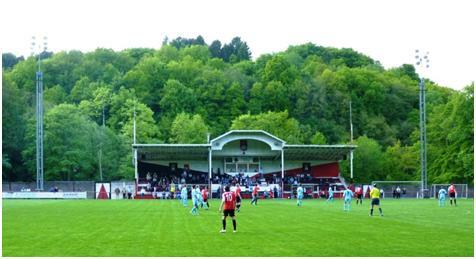 Inside the magazine, the home team are describe as a merger in 2003, between clubs known as AS Differdange and Red Boys Differdange. Red Boys provided the away team on my first visit to the Grand Duchy, buck in 1989. The Luxembourg team is also a merger, and even more recent between clubs previously known as Racing and Union  hence the now rather long title to include both names. No wonder most people abbreviate it to RFCU. Showing the large scale of terracing. The ground has been built by re-shaping the side of a hill, and on the hillside is a magnificent terrace of about 20 quite steep concrete steps. They show some sign of age, but are in general good condition. While this allows anyone who want to stand to do so, most people sit on the concrete  often with a beer bottle close at hand. Unfortunately for Deifferdeng, despite doing their own bit, and finishing a point above RFCU, the other results did not all go their way. Fola Esch could only draw at Dudelange, which sent the title to Jeunesse, and also left Fola outside the Europa League placings, but Grevenmacher won 3-1 at Etzella Ettlebrück and took third place. Still there is something left in the season for Deifferdeng. 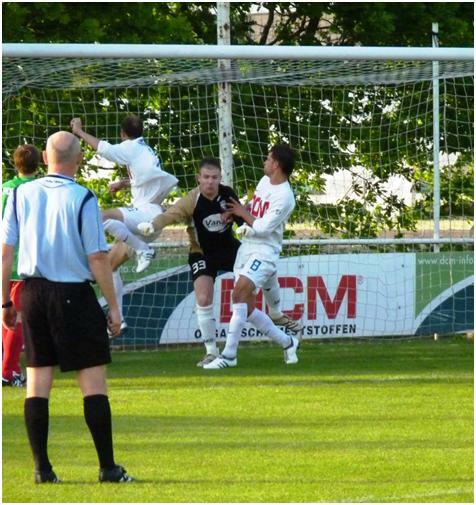 On Tuesday night they play Etzella in the cup semi-final, while Grevenmacher play Fola Esch. The eventual cup winners take the remaining Europa League place. For Deifferdeng, this provides to chances  they are in Europe if they win the cup, or if Grevenmacher do so. It is a pity though that even for a qualifying round match played in front of not many more than the 420 given as the crowd against RFCU, UEFA will deem the ground as unsuitable, and force it to be played elsewhere. After the lengthy travels of the previous day, getting from Inverurie to Banff was a short run on country roads. The 26 miles took about 40 minutes. Banff is a bigger town on the coast, and has a small but picturesque harbour. The prevailing grey stone is still the norm, so often covered with a very unattractive pebble dash finish. Still, the town is more impressive with a few grand buildings. 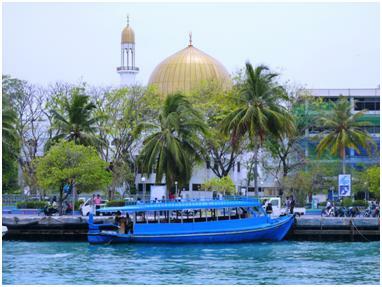 There was no early morning bustle about the place though, and both the centre and the harbour side seemed very quiet. 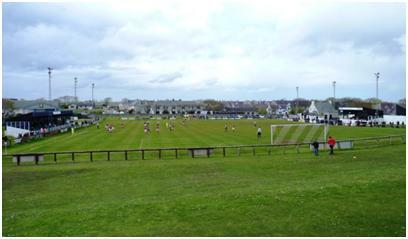 Banff is at the mouth of the river Deveron, and it is the river that gives the name to both the town’s football clubs. 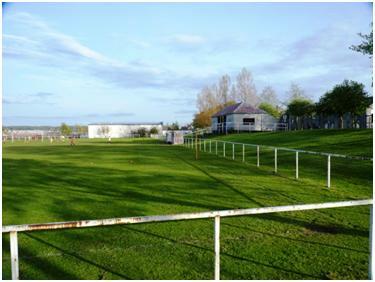 The Highland league club, Deveronvale was founded by a merger between two clubs, Banff Rovers and Deveron Valley in 1938. Their greatest successes though have been in recent years, with their only two League titles coming in 2003 and 2006, with a Qualifying Cup success in 2002. Arriving in the town from the south, and over the Deveron bridge, the ground is directly in front of me before I enter the town. It looks impressive with the main stand sitting up high. Indeed this is one of those higher stands, with around a ten foot drop below the lowest seats. The area in front of the stand is narrow, and is not open to the public, but both team benches are here. The stand incorporates the dressing rooms downstairs, and a boardroom and supporters ‘ club bar above. The bar is not well advertised and I only found it by chance while looking for team lists, (they readily found me one in said bar). 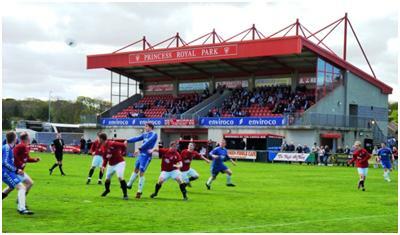 Outside, spectators can stand on a concrete path only on the side with the stand, the other three sides of the ground have grass surrounds, with just a slight banking. 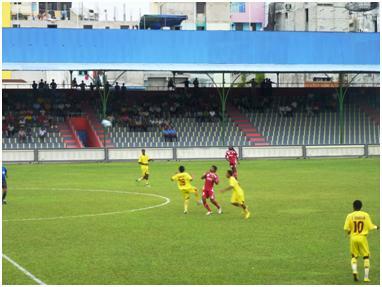 The match was between the teams placed fourth and second in the league, but visitors Cove knew that no result could move them either up or down from second position. The homesters could not drop a place, but rise up to third with a win  a position they keep only if Fraserburgh lose to bottom club Rothes next week. The match had an end of season feel to it, played without a great deal of pace, but on a fine lush surface, ‘Vale were shown to be a good footballing side, with some fine passing moves finding spaces for players on both wings. A tendency to be caught offside, and poor finishing were more at fault for keeping the score down then and defensive abilities on the part of Cove. Steven Gauld put ‘Vale ahead just before the break, and then added a second with fifteen minutes to play. 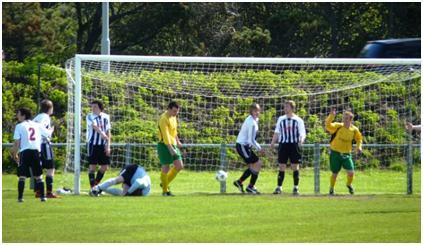 Two minutes later, Graeme Webb added a third to complete a surprisingly comprehensive scoreline. Cove were down to 10 players for the last 18 minutes after left winger Dean Lawrie went off injured. 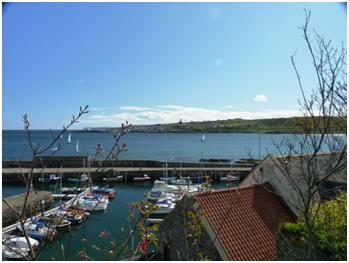 From Princess Royal Park, the walk to Canal Park, the home of Deveronside is quite easy. 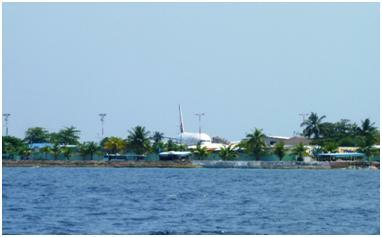 One exits the ground, turn right and wait until you are clear of the first ground. Canal Park is a railed off pitch, next to Princess Royal Park. There is a dressing room block well behind the goal, and this has a veranda area which provides a little cover  if rather a distance behind the goal. In the home side line up, one of the players had earlier came on as substitute for Deveronvale in the last five minutes of the earlier game. I had thought that there were rules about Junior players playing for Senior teams, resulting in the familiar name “A. Trialist”, on many Scottish League team sheets. It appears that the Junior FA has relaxed its rules, the wording now being “A player registered by a club in membership shall not take part in Senior games or matches unless he has the written consent of the Secretary or other official of the Junior club for which he is registered for each game”, which I take it as meaning that if the player concerned was a Deveronside player, he could play for Deveronvale with written permission for each game (he has been substitute on several other occasions), but as far as I know, players with Senior clubs still have to go through a re-registration process to rejoin the Juniors. After the game, I drove two hours to Inverness, and in the morning a further two hours to Wick, to get to Wick, the most Northerly Senior club in Britain. Before this trip, I had only seen one Highland League game in over 20 years. That game was Inverness Thistle’s final game in the league, before the merged with rivals Caledonian to join the Scottish League. Although the Highland League had lost three clubs, two from Inverness and Ross County, only one replacement was elected. It was a brave decision by the clubs, as the new boys would have to travel just over 50 miles for the closest match, and over 100 miles for every other game. 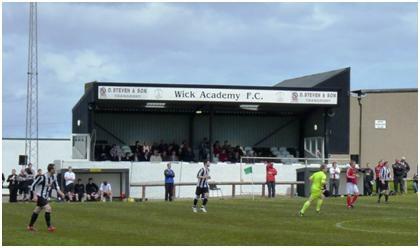 Wick were already known to the Highland League clubs  as a Senior club and member of the Scottish FA, they playing in the Scottish Qualifying Cup. 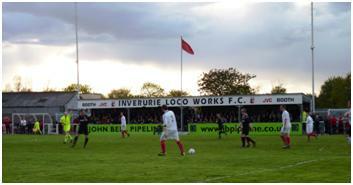 Second in the 1994 poll was Inverurie Loco Works, who eventually entered the league in 2002, transferring from the Junior game. Prior to joining the Highland League, Wick had over 100 years of history, founded in 1893 and taking the same name as a local Cricket club. 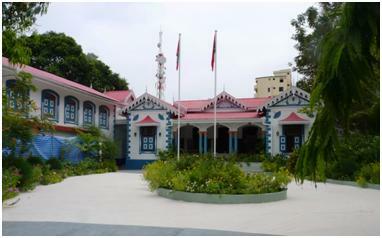 The Academy in question is Putteney Academy, and while there was never an official connection between club and school, a teacher from the Academy was elected as first club captain. Wick gained full membership of the Scottish FA in 1911, allowing them to play in the Qualifying Cup, The beat Inverness Thistle in their first ever Scottish Qualifying tie, but lost to Caledonian in the second. Through the 1920s and 30s, as the only SFA club in Caithness (excepting Thurso Pentland 1933-6), they were allowed to sign other local players for cup ties, and were virtually unbeatable at home in the cups for many years. The 1960s bought a problem when the local amateur FA switched to summer football. Wick had to remain a winter side in order to play their cup ties, but for 12 years they only played Friendly games and Cup ties. They then joined the Northern Reserve League, which as its name suggests was mainly for reserve teams. 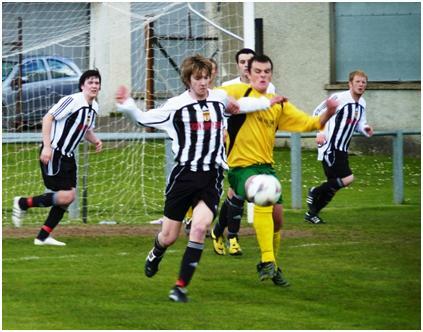 The league later became the North Caledonian League, and still runs with 10 teams. Thurso, (which is north of even Wick) are the current Champions, while Fort William are the only reserve team now in membership. Harmsworth Park is easily found, as it is on the road as you enter Wick from the South, just as you come into town past the inevitable retail park. Visitors to this part of Scotland go for what lies between the towns, rather than the towns themselves, and Wick is no more inspirational than the other places visited on the trip. The trip up did take me past some quite dramatic coastlines, while out to see, one could pick out the outlines of oil rigs in the distance. 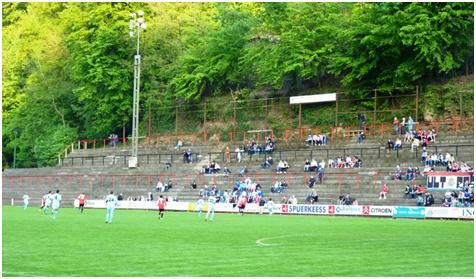 The football ground is neat and tidy, with a small seated stand on one side and a much longer stand opposite. This is generally for standing, but there is a single row of seats at the back, many in a very poor state of repair. One assumes this is a remnant from some decision to increase the number of seats  which was poorly carried out as anyone using them would have their views blocked by those standing further forward. From the main road entrance, there is a tarmac path providing a route to post areas of cover, but at the other end of the ground, the pitch barrier is surrounded only by grass. The pitch slopes up slightly, and above the top end, there is a gentle grass slope running back another twenty yards or so. Above this is a much steeper slope with a car park on a terrace at the top. There is a top entrance to the ground allowing access  as there is no sign of this from the main road. I parked on the main road, along with the visitors coach, and some of the other spectators. I was told by an Inverurie official that with the match kicking off at 1.30 in the afternoon, they had left at 6.30 in order to get here. I was surprised they had agreed to the unusual kick off time, but as it turned out, they had actually requested an early start, preferring this to a late finish when most of their players would have to work the next day. They had to abandon a plan to send mainly youth players up for this game, as Monday was the start of exams for those still at school, but still Inverurie managed to make five changes from the starting XI I had seen two days before, and added four further fresh faces on the bench. Wick has also played on the Friday night, losing 6-1 at Rothes, but made only two changes to the starting line up. 180 people attended the match, (I got to this figure with a head count, and found exactly the same figure on teletext in the evening), paying £6 to enter, and £1 extra if they wanted a programme. Using Leo’s theorem about equal levels of football producing equal attendances, this places the Highland League as a Scottish equivalent to a Step 3 League (Northern Premier, or Southern Premier) in England. This I feel, is about right. The English League’s would not accept the Highland League grounds on the basis of size of paved pathway or number of empty seats, but otherwise they are up to the standard. The football in the Highland League seems to be a more open passing game than the rough and tumble long ball and hope found in England  but I would not bet on the Highland defences to cope with the constant barrage of high balls into the area, whereas for all the attractive passing moves, the finishing was often lacking here. The game at Wick was very open in the first half, with plenty of chances at both ends. Wick took the lead on 27 minutes, and Inverurie faded badly after this conceding a second goal nine minutes into the second half, and being under pressure for most of the rest of the game. The Locos goalkeeper received his marching orders with only two minutes left on the clock for a silly contretemps while waiting for corner to be taken. If you are going to kick out, wait until the referee is not looking. The replacement ‘keeper did not make a save, and rather surprisingly, Inverurie pulled the score back to 2-1 in injury time. In 1987 and 88, I started my season with trips to the Highland League. The Highlanders started earlier than the English Leagues, and with midweek matches added, I managed to pick up seven grounds on the tours. But since then, I have only been that far north on one occasion, flying up to Inverness to see the last ever game at Inverness Thistle before they merged with Caledonian and joined the Scottish League. Having also done Thistle, plus Elgin and Ross who have also moved into the Scottish League, I have visited only four of the current members of the League. The reasons for ignoring the league are multiple  I started working in London, which made Scotland a less appetising prospect, but most of all because this was the time I discovered Europe. Keith was my 1000th ever ground, and the third of four on the 1988 trip. Ground no. 997 was the Parc des Princes in Paris and ever since I have travelled for my holidays. Incidentally, while I don’t think I have ever seen a Frenchman playing in the Highland League, a Scotsman (Eric Black) scored in that first European match. And so, 22 years after the last time I had driven this far, and sixteen after my last visit, I am back in Scotland for a long weekend. The drive up was a lot easier than last time. Once I had negotiated the local roads to reach the motorway, it was dual carriageway all the way to Inverurie, except for crossing the River Dee onto the Aberdeen ring road. While this short section did not cause me a delay, the ring road itself was the only real hold up on my trip. Inverurie turns out to be end of the dual carriageway, with a traffic jam starting on the main road at the point where I turned off for the town. Despite it being all dual carriageway (and do not try to count the number of speed cameras between Dundee and Aberdeen), the road network in Scotland is not what is should be  I cannot think of a single other city in Western Europe of Aberdeen’s size, that is not connected to the motorway network, or even has a decent by-pass. If the Scottish parliament is supposed to be counteracting the failure of the UK government to invest in the furthest off regions, then one must wonder if it is doing it’s job? The Highland League is almost a misnomer  the area it covers includes the Scottish Highlands, especially the Grampians, but most of the teams are in lowland locations between the Grampians and the East and North coasts. Inverurie is just a dozen miles from Aberdeen and appears to be an uninspiring town. The buildings are of the grey granite familiar to those who have visited Aberdeen  there are only a few B&B’s and I was the only guest at the one I stopped at. Notably, there is no mention of anything in Inverurie or close by, in the guides to attractions provided at the guest house. The local football club, Inverurie Locomotive Works were founded in 1903 and have spent most of their time as a Junior club. One must remember that in Scotland, Junior Football is neither a reference to age group or standard, but has an entire structure rivalling the Senior set ups, including the best semi-professional teams in Ayrshire and the Glasgow area. 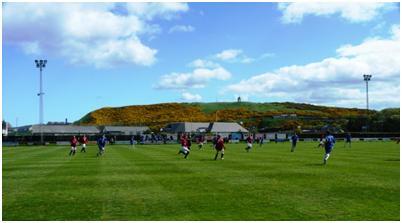 In the North, though  the Highland League has always provided the best football. 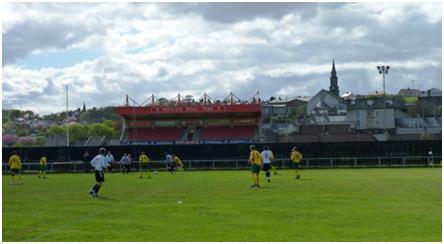 In 2001, Locos took the chance to switch to Senior football and the Highland League. This has provided a degree of success, as they have three times been runners-up in their new surrounds, and added the League Cup and Qualifying Cup twice apiece. (The qualifying cup is played primarily to qualify for the Scottish Cup, but the last few teams also continue their own knock out to a final). Somewhere in the mists of time, they have lost the motive from their name and are now officially listed as Inverurie Loco Works. Hathaw Park. Note both teams play in change colours, while the officials have a garish yellow strip! The visitors, Formartine United are one of three clubs to have joined the Highland League this season. Like Locos, all of the trio have transferred from Junior football. Formartine have had the best opening season, lying in 7th place, two above the Locos. Not only are they the closest rivals to Inverurie, but they have a reputation for having more money to spend then their rivals. 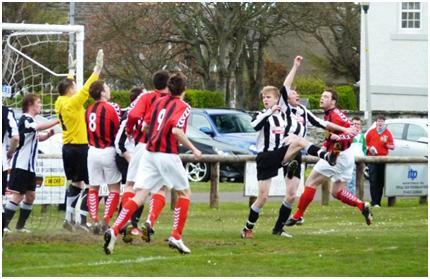 The management team is ex Locos, and over half the team has also played for Inverurie, many as recently as last season. This has led to a little bad feeling and some accusations of poaching players. 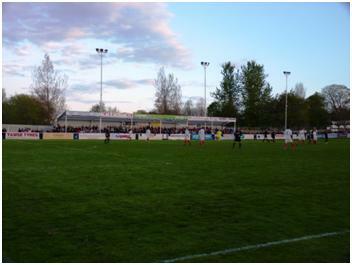 But of course, these things are the lifeblood of football, and no doubt helped to draw a crowd of 792 to Hathaw Park. The Locos home ground is less than a mile from the centre of town and much of the area between the railway station and the ground was once taken up by the said Locomotive Works. Only a couple of sheds remain, with much of the site now given over to a large Tesco’s store. I would guess that the Loco Works was the major industrial site leading to the growth of the town, while now it acts mainly as a dormitory town for Aberdeen. The ground is neat and tidy and has clearly been much improved in recent years. It has relatively small areas of cover on both sides, one given over to seats, and one to standing. The standing enclosure is certainly a new addition. Dressing rooms and a clubhouse are behind the goal at the top end, where the crowd enters and leaves. The ground slopes down a little with a small industrial concern behind the lower goal, and the railway hidden behind this. Much of the fencing is also clearly new. Next to the ground is another pitch, also railed off, with a small amount of cover provided at the entrance to the dressing rooms. The sign announces this as Colony Park, and this club, which is mainly for youth teams, acts as a feeder to the locos. It was £7 to watch the game, and £1 for the programme, which I assume was a reduced size as the printed cover showed a £2 charge. The game quickly became a formality  Formartine opened the scoring after just eight minutes, when their top scored, Barry Somers was given the ball in space on the edge of the area. Two minutes later, the Locos were reduced to ten men as centre half Michael Morrison was given a red card. I assume he went into the challenge studs up, although I could not tell from my angle. The referee applied the sanction without hesitation. The closest the home side came to scoring was on 20 minutes, when they hit the bar, and Formartine scrambled to keep the ball out, but two minutes on, Somers was left unmarked to head in the second goal. Although Locos always tried to make a game of it, Formartine added two more in the second half  a superb strike by Alister Graham (one of the ex Loco contingent), and the completion of Somers’ hat-trick. Despite the large and assumedly partisan crowd (many were wearing colours representing both of the teams), I thought the atmosphere was quiet and restrained, with no grouping together of fans or chanting. Those interested in visiting the Highland grounds may want to note speculation in the programme suggesting that the club may move from Harlaw Park to a new ground to be built at the Garioch Sports Centre. The area around the ground is likely to be used for more housing as the town expands. You are currently browsing the Football Shaped blog archives for May, 2010.